Three US college basketball players have been released on bail after they were arrested in China for shoplifting, according to US media. The players of the University of California, Los Angeles (UCLA) were caught shoplifting at a Louis Vuitton store, according to ESPN. The UCLA team is in China to play their season opener against another US team, Georgia Tech. US President Donald Trump is currently on his first visit to China. The players that were held in the city of Hangzhou are Cody Riley, LiAngelo Ball and Jalen Hill, according reports. Ball is the younger brother of LA Lakers player Lonzo Ball. ESPN later stated that the trio had been released on bail. "We are aware of a situation involving UCLA student-athletes in Hangzhou, China," UCLA Athletics spokeswoman Shana Wilson said in a statement to several US media. "The university is co-operating fully with local authorities on this matter, and we have no further comment at this time." 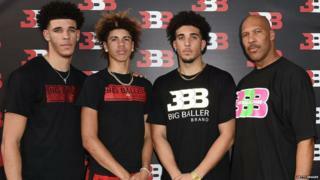 LiAngelo Ball's father, former basketball player LaVar Ball, issued a statement to ESPN saying: "It is a very unfortunate situation that the Ball Family, and UCLA has to deal with at this particular time. We will comment shortly." Three Georgia Tech students had also been questioned but were not arrested, the university said in a statement to US media. The two teams are in China as part of their league's Pac-12 Global initiative, aiming to boost international recognition and the personal experience of players. The season opener game on Friday in Shanghai is being sponsored by e-commerce giant Alibaba.